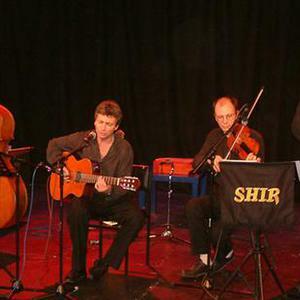 "Shir provides a harmony of shalom and happiness, and combines virtuosity with accessibility" Shir is a complete Jewish music group - Klezmer, Israeli, Sephardi, Yiddish, Ladino, Mizrahi and Simcha music all mix together to create a spontaneous, energetic and soulful musical experience. The quartet recently celebrated 13 years playing together during which time it has become a regular item on the UK Jewish music scene playing numerous functions and concerts (events for UJIA, Jewish Care, World Jewish Relief and WIZO, Limmud, Trafalgar Square, St John Smith Square). The band has toured Spain several times and have recently participated in the International Jewish Music festival in Amsterdam where they were awarded the Mira Rafalowicz prize for Best Yiddish Song performance.